BuyReservations.com is committed to providing the best airport hotel options for FLL. Our airport hotels, which include parking and airport shuttle transfers, are a great alternative to airport parking*. We strive to get the most affordable rates at the most reliable hotels. Our Park Snooze and Fly package will make your travel experience seamless and convenient at Fort Lauderdale - Hollywood International Airport. *Unless otherwise noted, see Park Snooze and Fly Package Information below. 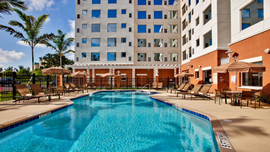 Our Park Snooze and Fly Package includes 14 days of free parking at the hotel near Fort Lauderdale - Hollywood International Airport while you're enjoying vacation and a one night's stay at Hyatt House Fort Lauderdale Airport & Cruise Port the night before your flight. Alternatively, we can provide hotel accommodations on the night of your return. Lastly, shuttle transfers will be provided to Fort Lauderdale - Hollywood International Airport when you depart and transfer you back to Hyatt House Fort Lauderdale Airport & Cruise Port upon your return so you may get your vehicle. If you have a late landing, staying the night of your return is also an option. You can take advantage of parking your car at the hotel prior to your flight and getting well rested at the hotel the night of your return. Our Park Snooze and Fly Packages are an excellent way to make airport parking convenient and affordable. 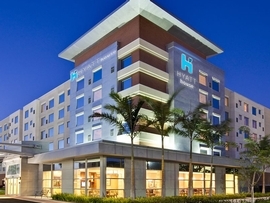 The Hyatt House Fort Lauderdale Airport & Cruise Port allows late arrival check-in so you know your room will be ready even if you have a late landing. If you need more parking than the included free parking at the Hyatt House Fort Lauderdale Airport & Cruise Port, you may extend the parking duration for an additional fee of (8.00 Per Additional Day) paid to the hotel. 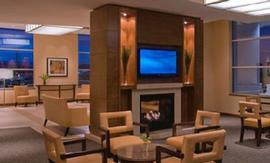 The Hyatt House properties are beautifully designed to accommodate the needs of extended-stay travelers. Clients will feel quite at home since each and every room is a suite, resembling similar attributes of an apartment. All rooms include a full kitchen, a relaxing seating area, and updated furnishings. 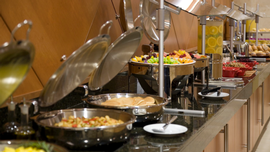 After a great night's sleep, be prepared for this hotel's delicious full breakfast, included at no additional cost. This hotel chain provides free Wi-Fi, rotating flat-screen TVs, Plug-N-Play TV adapters, and remote printing. 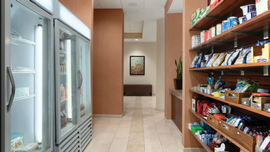 Every Hyatt House hotel offers an outdoor common area and most offer outdoor grills as well. In addition, this brand also has business centers, fitness centers, and many locations have pools. Come and experience a spacious suite, a hot breakfast, and so much more and see why this hotel will easily become your home away from home! Click here to see all of our Hyatt House hotels which we offer in alternate cities. Transfer Note: Transfers run 5am-12am to port for approximately $12 per person. Hotel does not provide transfer service from the pier to the hotel or from the pier to the airport.